Blueberry picking is one of those things that I truly enjoy doing. Seeing those huge, ripe blueberries that aren't covered in pesticides, thus can be eaten straight off the plant, make my heart (and my mouth) so happy. Add to it seeing chubby little hands grab blueberries and shove them in their mouths, it's just amazing. 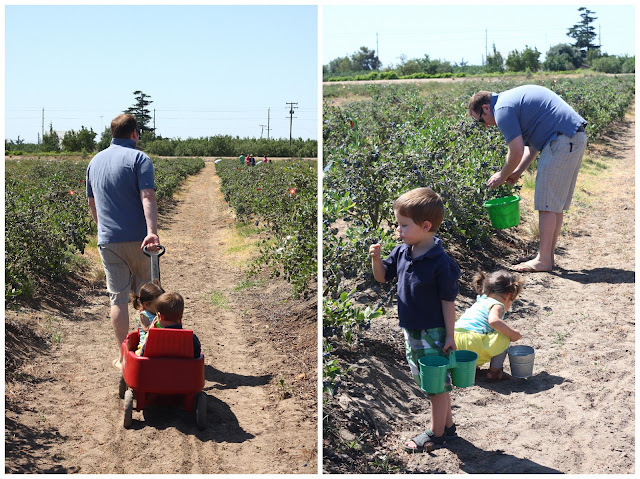 I was so happy to discover Jessop Farms two years ago and we have been going multiple times a season ever since. Every year seems to be getting better and better. This year we went on opening day and let me just say, it was amazing. It wasn't too warm out and there were huge blueberries everywhere. We brought the wagon instead of a stroller and it worked out great. The kids hopped in an out as they pleased and it made for a great place to dump extra (and even full) buckets. Plus, I didn't have to worry about how dirty that plastic beast got! 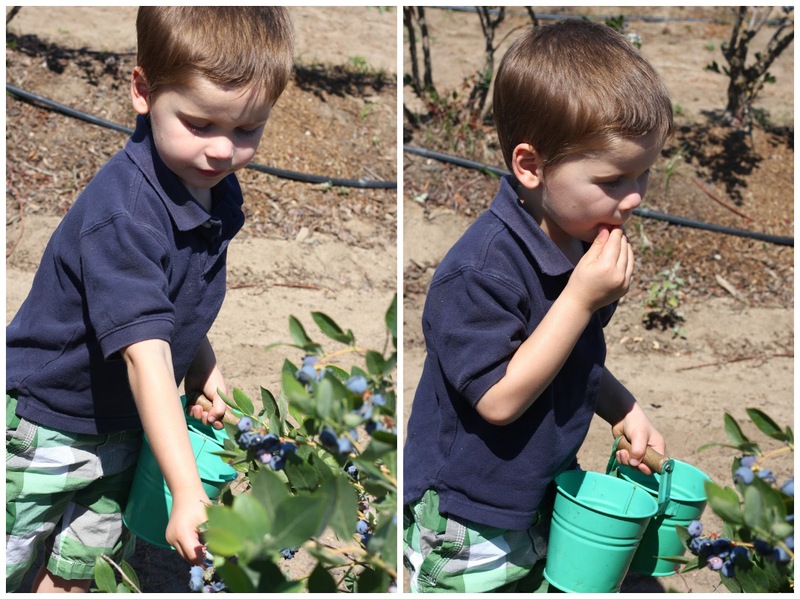 Every year we have taken Connor blueberry picking, he has been more concerned with eating the blueberries than with filling his bucket. This year was no exception. I'm not sure if any blueberries made it into his bucket. And we always have to guard our bucket so we actually have blueberries to take home with us! 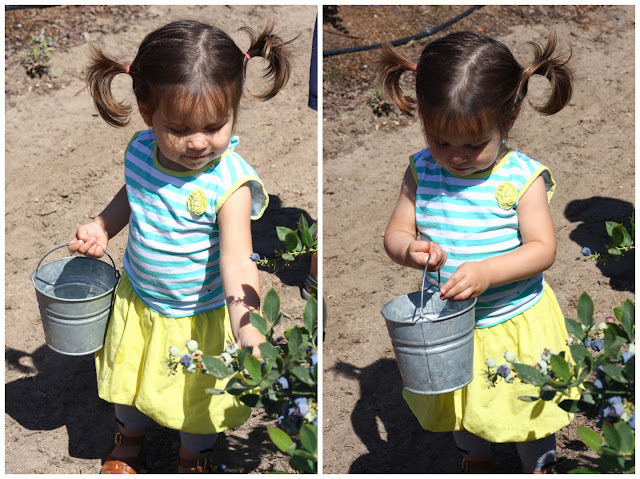 This was Isla's first year participating in the picking. Last year she was just a wee little babe...that made me sweat from wearing her and made it hard to pick or run after Connor, for that matter ;) Though she did eat the occasional blueberry, she was way more into picking them and putting them in the bucket. And I was actually impressed that she got so few green blueberries...I'm not sure if that was due to me trying to explain it to her or due to sheer luck! I'm excited to take the kids out again. They both are at an age that it wasn't a stressful experience. Both kids enjoyed themselves and we left with almost 6 pounds of fresh blueberries! Of course, two days later over HALF those blueberries are gone. We are going through them fast! But, I would rather my kids ask for blueberries over candy. And it just gives me another reason to go out there again soon. You can read about one of our blueberry picking experiences from last year here...after rereading it, I definitely had a better experience this year. Both kids were enjoying themselves and so was I.